Ever heard of radon? Well, it’s a big deal. It’s an odorless, colorless gas and is the second leading cause of lung cancer in the United States. It can get trapped in our homes and be at high levels that effect your health and you wouldn’t ever know it unless you tested for it. So read below to learn more about the who, what, where, how to test for radon in your home and remediate it if you have high levels. Radon is a radioactive gas that comes from the natural breakdown of uranium soil, rock and water. It moves up through the ground and into the air above. It can get into your home through any foundation cracks or holes. It can also enter your home through well water. 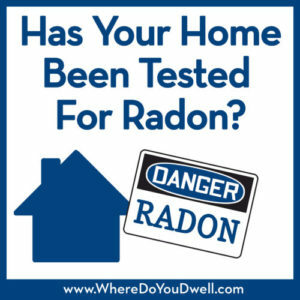 According to the EPA, nearly one in 15 homes in the U.S. has an elevated radon level of 4 pCi/L. Any type of home can have a radon problem, even those without basements. You can contact your state radon office to find out more about radon levels in your area or check out this website at county-radon.info. Even if your home is in a low level zone, you should still get your home tested. For example, homes that are next door to each other can have different indoor radon levels. Testing for radon is actually easy and not complicated. It’s important to test the lower levels of your home, i.e. those below the third floor. You can purchase or order online devices to test for radon, or you can hire a qualified radon tester to come to your home. Some devices may be more appropriate for your needs and testing conditions. Make sure you are getting a reliable testing device. Passive devices – Don’t require power and are exposed to the air in your home for a specified period of time and then sent to a lab for analysis. Some devices are better at resisting test interference or disturbances. Includes charcoal canisters, alpha-track detectors, charcoal liquid scintillation devices, electret ion chamber devices. Active devices – Require power and measure and record the amount of radon or its decay products in the air. Many can provide a report and also indicate if there are any swings in radon levels during the test period. Some also have anti-interference features. These active devices cost more than the passive ones. Includes continuous radon monitors and continuous working level monitors. Keep in mind that you can conduct short-term testing, which is typically from a minimum of 48 hours to 90 days. This type of testing may be something that a home buyer may request before purchasing a home, or if there are other time restraints rather than a real estate transaction. Long-term testing typically lasts more than 90 days, and will usually provide a year-round average radon level. No matter what type of testing you conduct, it’s important for family members to follow directions carefully and to keep any interference to a minimum so you can get reliable results. The EPA recommends fixing your home if levels are between 2 and 4 pCi/L or more. The average indoor radon level is about 1.3 pCi/L. Remember that high levels of radon in your home is a health risk and a leading cause of lung cancer. Don’t think that it’s complicated or expensive to fix any radon problems. It can be done without making major changes to your home, and the cost can be comparable to other home repairs. High levels can be reduced several ways, including sealing cracks or installing venting pipes and fans or sub slab suction. Get estimates from radon mitigation contractors. They can determine the most appropriate system for your home. Before you embark on any major home renovation, get your indoor radon levels checked. This is especially true if you are renovating a basement or lower level room in your home. And test your radon levels after you have completed any work since levels can change. Also, it is better and less expensive to install a radon-reduction system during your renovations than afterward.